>We are Jess and Shimul from Bhalo. 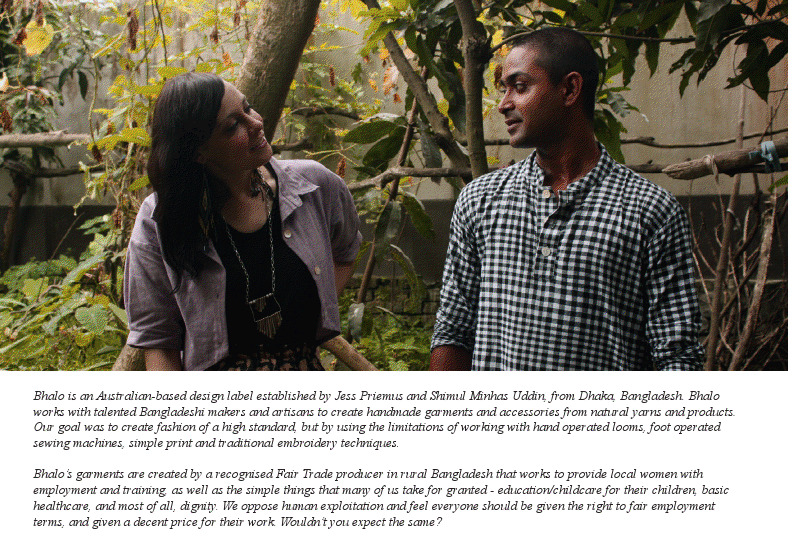 We work with makers and artisans in Bangladesh to create original, handmade garments and accessories from natural fibres. We released our first range in 2009 and since then have been featured in several magazines and blogs, including The Age (Melbourne) Magazine, The Design Files, Michi Girl, Peppermint magazine, and soon to be released Vogue (Mexico), Lucky Magazine (USA) and Grazia (France). We have stockists in most Australian capital cities, as well as New York and Los Angeles. We also sell online, and most of our customers come from USA and Melbourne (particularly the inner city suburbs). Our producer is registered with the WFTO (World Fair Trade Organisation), and provides employment for 200 women, and free schooling and daycare for their 300 children.